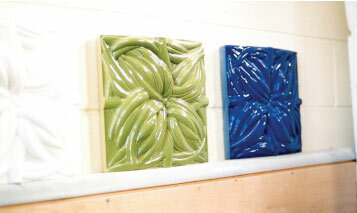 Faience as used in the building industry is essentially a glazed ceramic stone or heavy tile. Produced in quantity from the late 19th Century the stone was considered a pollution proof alternative to natural stone. Unfortunately the ‘heyday’ of faience manufacture coincided with the ‘revolutionary’ use of steel in buildings and this and incorrect cleaning techniques have contributed to its its failure. The manufacture of faience is a highly specialist craft, particularly where the material is used for replacing defective stone within an existing façade. When fired, the clay body will shrink in the kiln so the modeler or sculptor, has to produce a clay body 11-12% larger than will ultimately be required. It is for this reason that it is not possible to just take a plaster or latex mould off an existing stone. This large £100 million retail shopping centre was developed jointly by Grosvenor Estates and Basingstoke Corporation. London Restoration was awarded the contract to design the concrete supporting substrate and supply and fix this, together with a unique 40 mm thick faience tile. A water reservoir was fitted to the top of the concrete tube allowing water to cascade over the tiled relief. Both the bedding grout and joints were formed in a specialist waterproof mortar.